Sunday is supposed to be the day of rest right? 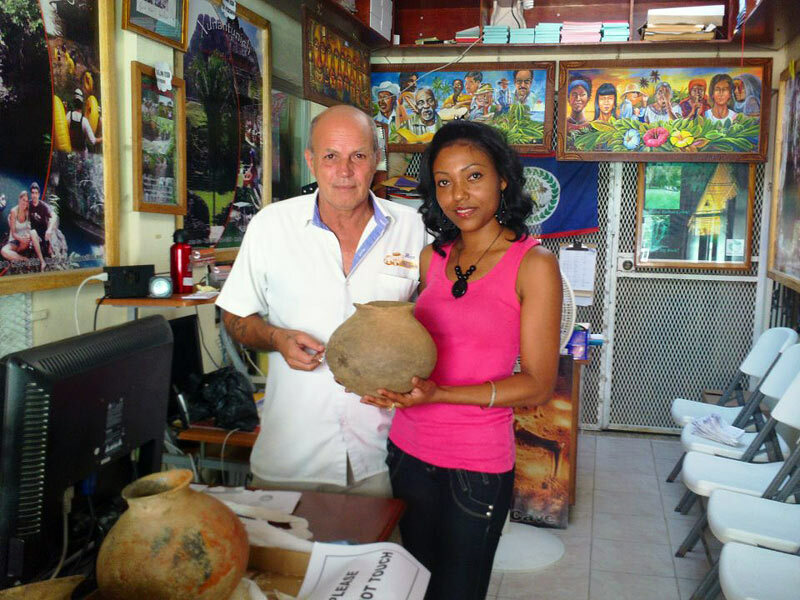 How surprised I was to receive a call from my uncle Fernando Cruz, that pottery was being unearthed from beneath Burns Avenue, the principal street in San Ignacio Town. I thought to myself, should I go and take some pictures of a few sherds they are finding and call it a day? At least that's what I thought it was. I was not ready for the Sunday that unfolded, where for once in my life, myself and the fellow archaeology enthusiasts became tourist attractions for a day. 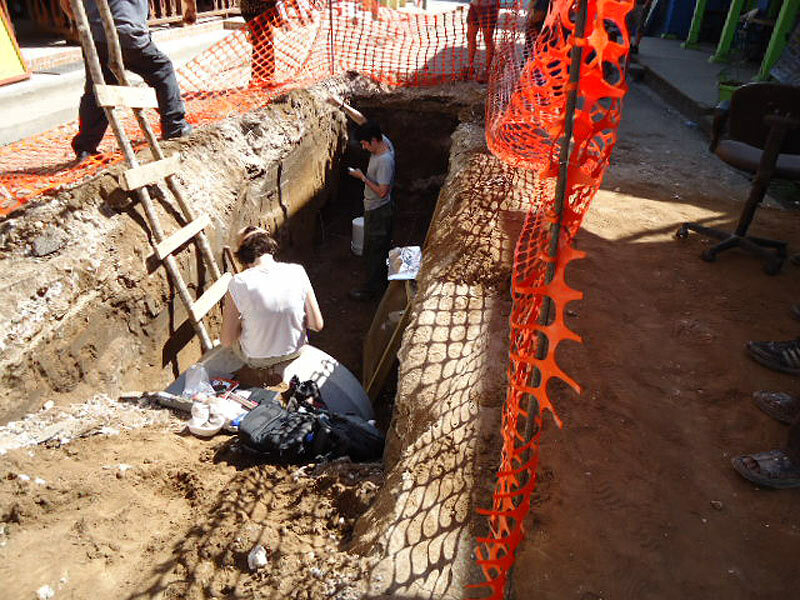 In the hot sun (and nursing a hangover) I arrived at the site, to find a large trench dug, apparently for drainage pipes. I saw the men pulling out pieces of pottery, and lots of shells as well. I said to myself, you're brave enough, give them the cease and desist order. I puffed out my chest, asked who was in charge, and gave the order. I was told of further vessels that were pulled out, resting in the office of Pacz tours, under the careful eyes of one Mr. Bob Jones. To my amazement, there were partially or almost whole vessels. I was very glad when Bryan Woodye and George Thompson, both of the IA, arrived with a police officer to give the official cease of duty order. With the vessels in safety, as well as a bone fragment, shells and hundreds of sherds, they went on their way on previous errands with the treasure in tow. The real fun of the day began, when an impromptu dig was green lighted. Myself, Sherry Gibbs and Fernando Cruz began the salvage operation, and eventually added Galen University students and former students Josue Ramos, Rubio Tzib, Adrienne Wright, April Martinez and Sylvia Batty. 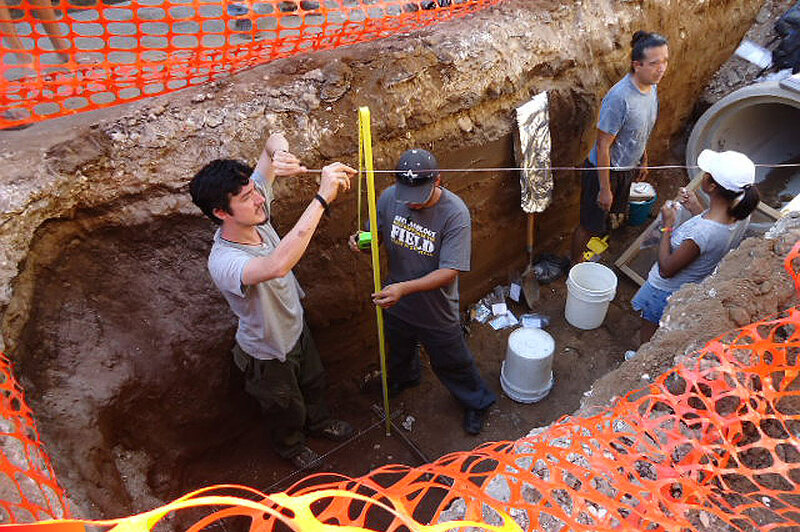 Calling in reinforcement and getting tools and buckets, we set up the 1X1 meter unit, and began to descend further beneath the busiest street in San Ignacio. We quickly became a point of interest for the passersby, some who stood or sat and watched for hours as we dug, exclaiming over each pretty pottery piece coming out, the large amount of shells, the ONE obsidian fragment, and even more curious, what seemed like a fragment of historic period porcelain. Tyler Hess (center) and Samantha MacFarland (left) hung around most of the day, giving moral support, encouraging us, and Taylon Angelino (right) became our official line level dude, and how could we not with his years of experience in engineering? 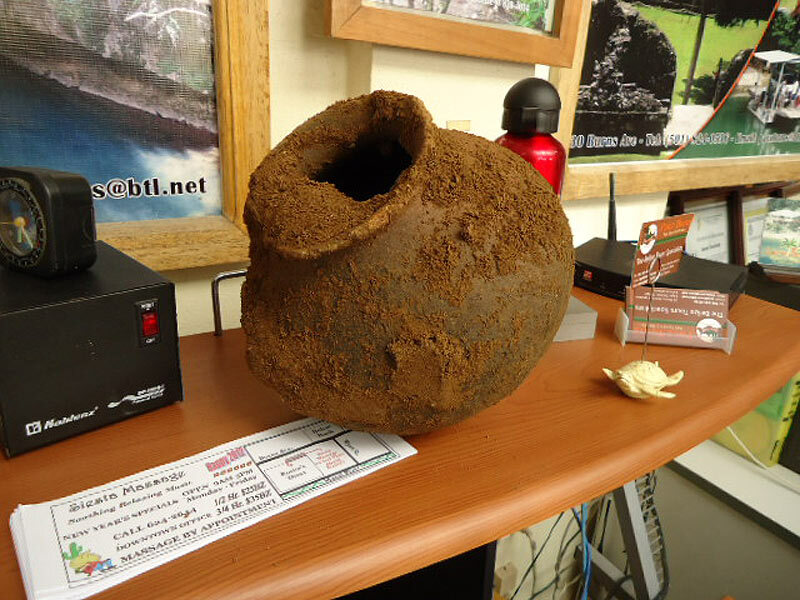 The biggest surprise of the day was when chief Belize Maya archaeologist, Dr. Jaime Awe, showed up to declare that the vessel fragments found thus far were of the Late Preclassic Period, which is about 2000 + more years before Flayvas and Mayawalk were even conceived. And we were glad to know this, as unfortunately to myself and Ms. Gibbs, Dr. Jim Aimers was not around to quickly classify each piece. Ahh Jimmy, we miss you. Dr. Awe, straight from the aiport and quite possible a long flight, came straight to the site, looker as eager as can be just to be witnessing the events unfolding on Burns Avenue, an actual archaeological dig. What can be said except trowels must run in his blood and line levels in his dreams. 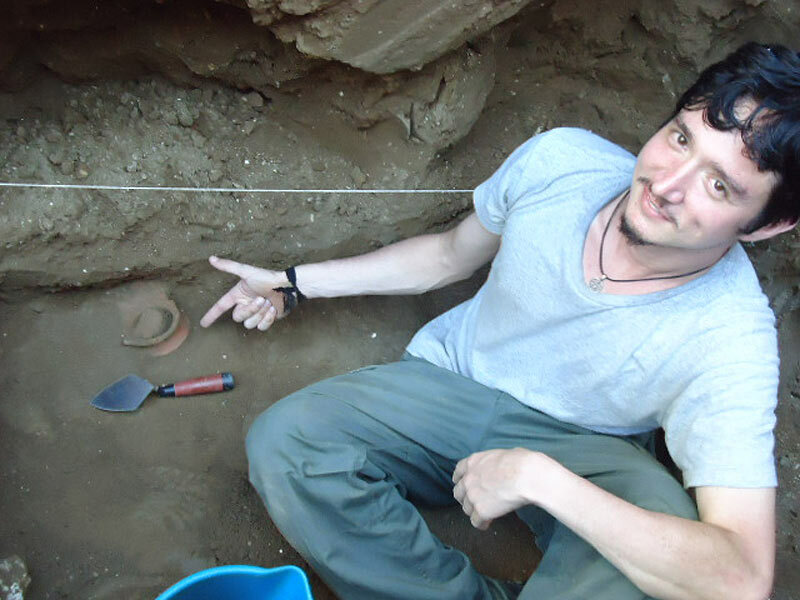 After six excavation levels, bags of beautiful chert, nice slipped ceramics, an obsidian flake, lots of shell and jute, and even bone, we had to call it a day when the sun decided to set anyway, and visibility became dim. It is truly something interesting for San Ignacio, particularly in 2012, that we can say that the Maya made their presence known as far as down town, and not only on the glamorous hills of Cahal Pech. My neck is red, my back and legs are sore, and I am dusty and dirty. All I can say, it was the BEST Sunday I have had in years.